During the NFL offseason, no team in the league did more to improve their team on both sides of the football than the Philadelphia Eagles. Not only were the Eagles already one of the most talented young teams in the league with arguably one of the best head coaches in the NFL calling the shots on the sidelines in Andy Reid, but they went out and signed multiple Pro Bowlers and re-signed superstar quarterback Michael Vick to a six-year contract extension. The number one priority for the Philadelphia Eagles after the NFL lockout ended was to re-sign Michael Vick, but in the middle of their negotiations they sign free agent Pro Bowlers like running back Ronnie Brown, wide receiver Steve Smith, cornerback Nnamdi Asomugha and quarterback Vince Young. These additions alone would have made this squad a perennial playoff team with Super Bowl aspirations, but after trading Kevin Kolb to the Arizona Cardinals for Dominique Rodgers-Cromartie they needed to sign Michael Vick for the long term. Fortunately, the Philadelphia Eagles were able to lock up Michael Vick for the next six years with a contract worth about $100 million dollars. Along with making more than $16 million dollars a year for the next six seasons, Vick’s new contract also has $40 million guaranteed. This is a lucrative deal to say the least for a player that hasn’t been able to play a full 16 games in a season throughout his entire career in the NFL. Granted, Vick has had a few 15-game seasons, but his style of play can be very injury prone as he likes to scramble and beat opposing defenses with his feet. 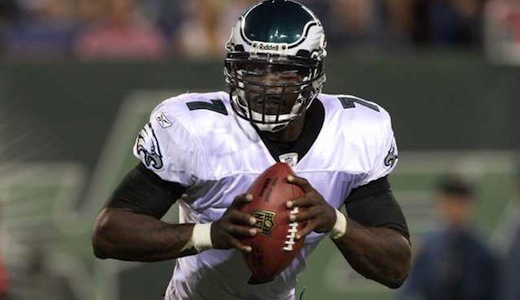 Despite being prone to injuries with his style of play, the Philadelphia Eagles were convinced that Michael Vick is the future face of the franchise after being so successful last season and becoming a NFL MVP candidate. Unfortunately, the New England Patriots’ Tom Brady won the NFL MVP, but everyone knew that Michael Vick was officially back as one of the best quarterbacks in the league. This season the Philadelphia Eagles will look to get some good production out of Michael Vick for the second straight season as the starting quarterback under center. As an insurance policy, the Eagles went out and signed quarterback Vince Young to be the new backup for Michael Vick which means Philly is about as talented at the quarterback position as any team in the league. It remains to be seen whether or not Michael Vick can continue to play at an MVP caliber level with the Philadelphia Eagles, but Andy Reid and company are confident that he can do just that, especially with offensive weapons like DeSean Jackson, LeSean McCoy, Jeremy Maclin, Steve Smith and Ronnie Brown at his disposal. With the new contract signed and a bunch of talented players surrounding him this season, Michael Vick will be the player to watch once again this year as the Philadelphia Eagles have their sights set on making it to the Super Bowl.